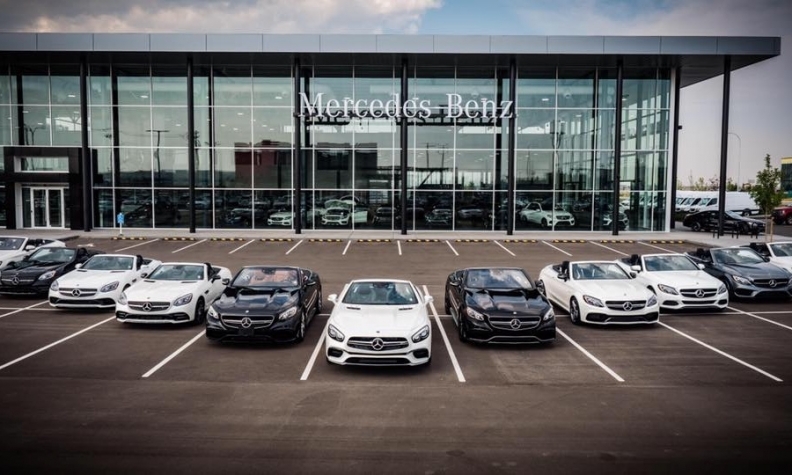 CALGARY -- A new Mercedes-Benz store has opened in Calgary, bringing the number to three, despite difficult-if-improving economic times in Alberta due to a contracting oil industry. The $35-million, 94,500-square-foot (8,800-square-metre) Country Hills Mercedes-Benz is the newest store in the McManes Auto Group stable and the third Mercedes-Benz dealership in the city. The others are Lone Star Mercedes-Benz and MercedesBenz Downtown Calgary. Mercedes chose the McManes Group in June 2013, said JoAnne Caza, Mercedes-Benz director of communication and public relations. The store will be McManes’s eighth in the Calgary area, a significant factor in winning the new franchise, she said. “We had applicants from across Canada representing all major dealer groups,” Caza said. “We shortlisted eight applicants and ultimately wanted a local dealer committed and connected to his community, as well as someone with solid experience. Built on an eight-acre (three-hectare) site in northeast Calgary at the intersection of two major thoroughfares and close to Calgary International Airport, the new facility has a 22,000-square-foot (2,000-square-metre) showroom with three-metre-tall glass walls. On opening day, there were 40 vehicles on the floor with room for at least 10 more. “We’re one of the largest, if not the largest, AMG performance centres in Canada,” said General Manager Colin Gingell. There are currently 55 people on staff including a dozen sales persons referred to as brand specialists. He said business has been “good” since Day One, but he did not provide figures. Eighteen months under construction, the new store has 31 service bays, eight detail bays, a drive-through wash bay, a threelane drive-in service reception area, customer lounge, kids play area and a deli that offers hot and cold breakfast and lunch items. It is the group’s 20th dealership and second Mercedes-Benz store (the other is in Edmonton). Caza said a third MercedesBenz outlet in Calgary makes sense given the significant expansion of the product lineup over the last few years. “There’s no question that this new dealership was needed to handle this incremental volume now and in the future. During the last half of 2014, the barrel price of crude oil plunged to less than US $50, from a high of nearly $110, which dramatically affected employment and discretionary spending in oil-dependent Alberta. Oil prices have fluctuated since, but nearly three years later, the price is once again below US $50. Caza said there was a longterm consultation with the existing dealers that began when both had exceeded their capacity for sales and service. As for Calgary, she said the product lineup is “well positioned to service Calgary’s growing and diversifying market.